Charming two story home on the big Deschutes River (2675+/- sq. ft.). Just minutes from Sunriver on the road to The High Lakes. Offering a large .75 acre lot with room to play. Don't forget to bring your toys (boat, jet skis, snow mobiles, etc.)!!! Rental guests have access to large, lockable shop with 4 over sized bay doors for parking. Featuring a wood stove, granite counter tops, high vault ceilings, air conditioning, indoor hot tub with plenty of windows to let the outside in and a large deck complete with gas BBQ to take advantage of the spectacular Deschutes River views. 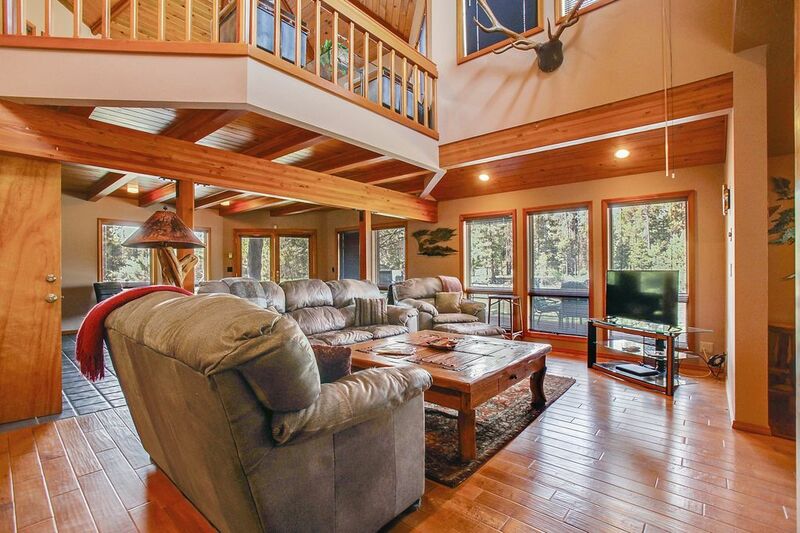 With this rental through Mountain Resort Properties, we provide local area discounts on dining, recreation and more! Ask us about our seasonal discounts offered on golf and Mt.Bachelor lift tickets. Great location. Huge property great for big families or friends. We loved the hot tub in the house lots of fun! Kitchen was amazing! The house was very nice with a great view of the river nearby where many kayaked and floated by. A flock of geese invaded the property several times and left their calling cards. It was a ways to go to restaurants in Bend but not too far from Sun River. The house was well equipped and we had a great bedroom (the Master) but the other 2 bedrooms were a little small. We did not use the jacuzzi as it was very warm when we were there but it would have been fun to use. It ended up costing a bit more than we expected at first with all of the added costs. All in all we had a very nice time in a very nice place. We are sorry to hear that your stay at Big River Hide Away was less than perfect. Any and all repairs mentioned have been made as necessary. We felt that the $100 was fair compensation as there was a second working fridge/freeze in the garage available for guest use. While not ideal, there was still a place for food & drinks to stay cold. Trash was picked up on designated date by trash company which is once a week. Unfortunately, the previous guest left just before this arrival and trash pick up was not until a day or two into the next stay. We have had several guests stay in this home both prior to and after this reviewer and have not received any notice as to beds being in poor shape and/or uncomfortable. Again, we do apologize for any inconvenience. Great house, great family vacation! !